The images used for colouring book graphics are usually cartoon-style characters that a previous designer has created. For the image to be used on the colour book graphic we have to convert image to vector without any colours (just black outlines). 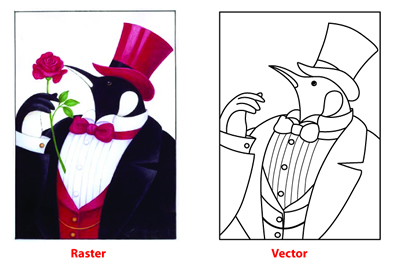 The vector can then be transferred to the colouring book (or alternatively to a website from were it can be printed) which can then be used by the children to colour in. On occassions a coloured in version and outlined version (called a wireframe) of the vector can be used for flexibility in certain circumstances. For example, the coloured version can be used on a poster while the outlined version can be used on a book distributed to the children. The children can then try to fill in the colours into the book usng the poster as a master copy. Colouring book graphics are a fantastic way of keeping children entertained. Many sites, including high profile ones such as the BBC publish these on their website to keep parents coming back to the site. Other companies print these on adhesive labels and a special machine is used to cut just the label along the lines - but keep the backing intact (rather like Avery-style labels). These are then sold at fairs where children can peel back each section and pour coloured sand on to them. If you have a logo or an image that you need to converted to a vector then please visit our homepage. Copyright © 2006-2019 PrintAnyFile.com and its licensors. All rights reserved.